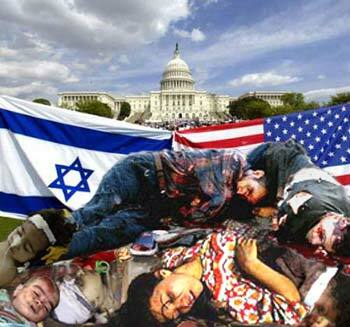 The US and Israel are like God; they create terrorists in their image. They're killing children and we're worrying about our language, Rose. It's unfair to the murderers to expect them to have our moral standards! Sick - the arms business just rubs its hands in situations like this - more income (be it US tax money or Israeli funds from other sources) - and what is more, they get field testing done, so they can improve their killing techniques. I notice that the "friendly fire" victims are hidden amongst the 56 military deaths so far - and the 2 civilians. Even hardened former reporters can't take the horror of the situation in Gaza.
" words are cheap " && " actions DO speak louder than words ", don't they ? I don't think there's any room for words like "morality" in a militarized society. Thanks for this video, Angelika! Israel currently has 262 Jewish-only settlements built on Palestinian land...but how many Palestinian settlements are on Israeli land--NONE. Women+children are not human shields...and Zionists are not Gods chosen ones. US stop being a lap dog 4 this Nazi regime. thanks Sam, please remember, I have not always time to comment or post to my friends pages the news. Please always check out BI, where I publish the hottest news or my blog posts. 'The US and Israel are like God; they create terrorists in their image'. GOSH is this saying great - and so true ! You allow me to use this quote Sam ? - is it from you ? Be my guest, Parsifal. I forgot to add "own" to it. 'The US and Israel are like God; they create terrorists in their own image." Thanks for the link. Disturbing stuff about Israel's atrocities. I m wordless. no word can describe what happens there, those commit crime, those who support or agree with Israel. You all are strongly invited to boycott Israel. United States of America: Land of Hypocrisy. Aiding and abetting Israel's ethnic cleansing while claiming to defend freedom and human rights in other parts of the world. I could go on and on and on with other examples, but then I'd get way off topic.